This will be a short but important post. 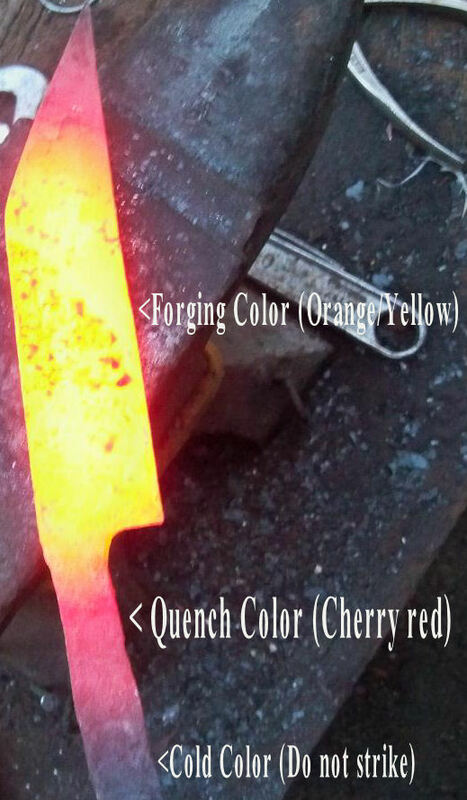 Above is a piece of heated spring steel showing the color needed to do different things. Sometimes having a true to life visual reference is the best way to get a feel for a certain technique or process. I hope this helps all the people just now jumping into the world of knife-making. The red color in my experience gets the most hardening but you can also quench at orange with good results. This entry was posted on November 4, 2011 by .. It was filed under Knife making-Blacksmithing and was tagged with 1095, anvil, Blacksmith, blade color, blade heat, bushcraft, hardening steel, heating color, high carb steel, knife color, knife heat, Knife making, knife quench, knifesmith, norse knives, quench color, quenching guide, seax, spring steel, steel color, tempering.